Expansive beaches on your door step. Welcome to the Blue Waters! We welcome you to our luxurious landmark hotel where golden beaches and the warm Indian Ocean are just a shell’s throw away. You are assured of a relaxing and memorable stay in one of our 262 newly refurbished guestrooms, most of which have ocean views and outdoor balconies. Our function packages can be tailored to your budget. 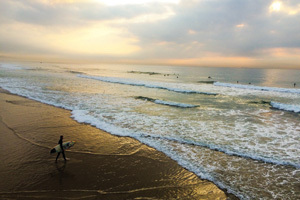 Well located on Durban’s Golden Mile, the hub of our city’s entertainment district, there is easy access to Durban’s sporting and corporate facilities. For fun lovers, there’s the Suncoast Casino and Entertainment Complex a short 250m walk away; for sports fans, the Kings Park Sporting precinct (including the Moses Mabhida, Kings Park Swimming Pool and Kings Park Rugby Stadium), Kingsmead Cricket stadium, Cyril Geoghegan Cycling Track, and Greyville Race Course are within walking distance or a short drive away; and for business executives the ICC, Durban Exhibition Centre and Olive Convention Centre are all within five minutes drive of the Blue Waters Hotel. Conferences, weddings and special celebrations are our specialty, with a choice of ten elegant venues, seating between 10 and 250 persons, we can guarantee a professional event. Our indoor pool invites you to chill out all year round. 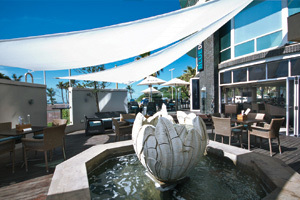 You can unwind in our Versailles Restaurant or the Blue Dolphin Cocktail Bar and Pizzeria. 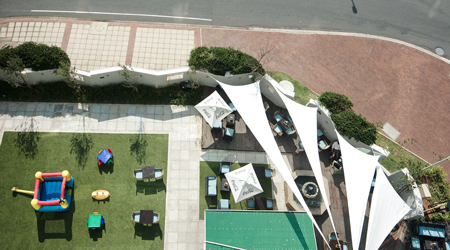 Whether you’re in “Durbs-by-the-Sea” for business or leisure, you’ll feel that the Blue Waters Hotel is your home away from home. 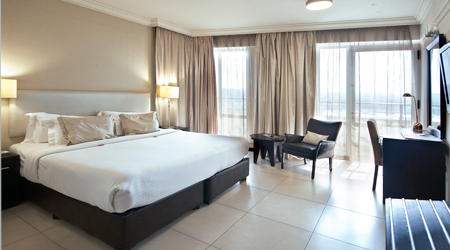 Relax and unwind in our recently renovated deluxe guest rooms, while enjoying views of the warm Indian ocean. 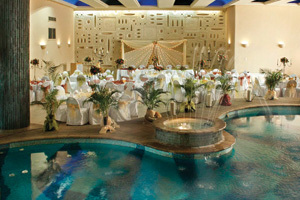 Start planning your Dream Wedding at the Blue Waters! 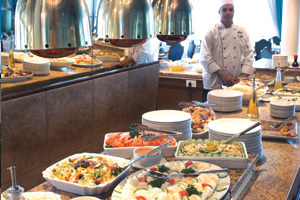 Our experienced coordinators and chefs will ensure every detail is just right. 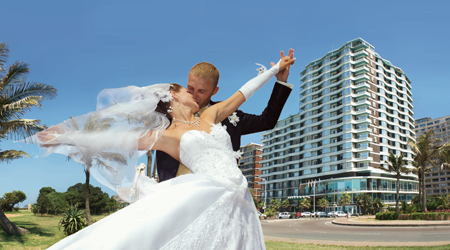 We offer four stylish venues, some with ocean views that stretch to eternity. We offer corporate conferences and functions facilities from 10 to 250 delegates. Ten elegant conference venues are available for the functional to the luxurious needs of the client. 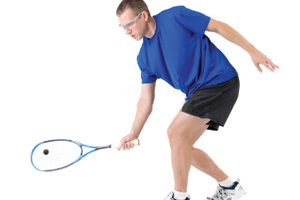 Our professional coordinators will handle every detail from start to finish. 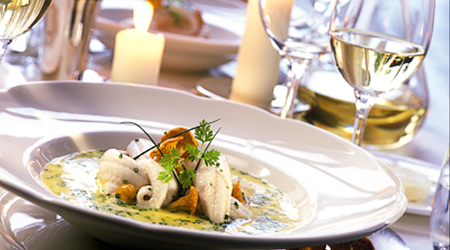 Dine in style at the elegant Versailles Restaurant or kick back at the Blue Dolphin Bar for cocktails, artisan pizza. For coffee extraordinaire and fine dining, Café Jiran is a one minutes’ walk away. In room dining is available 15 hours a day. 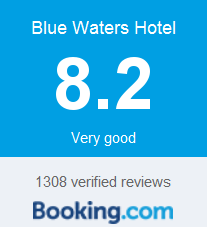 Based on reviews of establishments, Blue Waters Hotel has been voted Best Value for Money in North Beach for 2015. Gary and I would like to thank you so much for making our wedding day a fairy tale wedding. It was so well organised and the catering and decorations and the service from the staff was excellent. Thank you again, we really appreciated all that you did for us and we will recommend The Blue Waters to others. 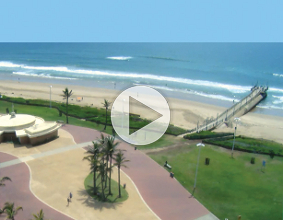 I have, over the past few years, been a guest at a few Durban hotels but I can say without a doubt that the service and professionalism at the Blue Waters Hotel has been top notch. From the moment I had arrived, the service at reception was speedy and efficient, my room was immaculate and spaceous and your staff were pleasantly helpful and grounded. I have been raving about your hotel to all my close friends and family during my stay and will continue to do so well after my stay. I know for sure where I will be staying during my next trip to Durban. Keep up the amazing service and standard. Thank you for the wonderful service we received during the World Youth Maths week - a very big thank you to your Chef/s. The food was excellent and enjoyed by all. 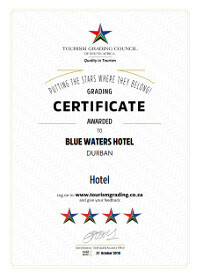 Blue Waters Hotel staff are very PROFESSIONAL, accommodating and helpful. I just want to thank you and your team for your excellent service and help in every way. Without doubt we will make use of your venue and services again. Your hospitality and helpfulness throughout this event has been out of this world. Just to let you know that you will definitely get all of my business and I will make sure of it that my referrals come through to you! Thanks for the lovely stay. Blue Waters has that charm and hospitality of a time gone by. I had the most recent opportunity of having dinner and breakfast at the Versailles Restaurant. I would like to compliment the restaurant for the excellent and efficient service, vast menu and lovely well presented and tasteful food served. The food served is presented fresh and very tasty indeed. Sure will recommend this establishment to my family when we arrange a next get together. Morne and I thank all your staff for all your hard work with our wedding. Our friends and family are still talking about how great the service and food was. Please tell all your staff that they had done a excellent job. I booked four rooms for 4 couples from 08 August 2012 to 11 August 2012 and believe me, we had a brilliant time with Blue waters hotel, perfect holiday for us. I want you to know how pleased we are with the outstanding service you have given us. I'm very pleased with the quality of your service. I have recommended your Hotel to others because of our satisfaction with your service. You made our holiday to be memorable, I'm definitely sure that I will come back again with other members of my family. We would like to thank you for ensuring that all was in order for the wedding and literally exceeding our expectations. The pool deck looked beautiful. I thank all your staff for a job well done. The service in simple terms was excellent. Thank you so much for a wonderful evening at the Blue Waters Hotel, our end of year function was a great hit! It was so great to walk in and everything was prepared as arranged. Top marks to Martin and his team for an excellent spread, the curry was unbelievable. Again, thank you for the excellent service and attention given through out the evening. I had the most restful holiday I could imagine at this beautiful hotel. The staff are so warm and welcoming and their food is divine ! I just want to thank you for a stunning wedding venue - it was absolute fairytale dream come true - everyone enjoyed themselves to the bone! I will definitely recommend friends who are getting married in future to guys!!! On behalf of all who attended, please accept our sincere thanks for a wonderful occasion. From the start of negotiations to the end, everything was done in a very professional way and contributed to a very successful event. Our compliments to the Chef and staff on a job well done! On behalf of all who attended, please accept our sincere thanks for a wonderful occasion. From the start of negotiations to the end, everything was done in a very professional way and contributed to a very successful event. Our compliments to the Chef and staff on a job well done!